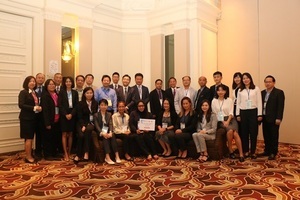 The ESCAP/WMO Typhoon Committee 13th Integrated Workshop "Technological innovation for typhoon related forecasting ad disaster risk reduction" was held from 5 November to 9 November, in Chiang Mai, Thailand. From Japan, JMA, MLIT, ICHARM and ADRC attended the meeting. The workshop was opened by Mr. Suphachai Iamsuwan, Governor of Chiang Mai Province, Thailand, Mr.CHO hyoseob, Han River Flood	Control Office, Republic of Korea, Mr.Yu Jixin-Typhoon Committee Secretary,Typhoon Committee Secretariat, Mr.Taoyong Peng,Chief of TCP Programme, World Meteorological Organization, Ms. Yuki Mitsuka, Associate Economic Affairs Officer, Disaster Risk Reduction(IDD), Economic and Social Commission for Asia and the Pacific(ESCAP), Dr.Phuwieng Prakhammintar, Deputy-Director General, Thai Meteological Department(TMD). In the following plenary session, a series of keynote lectures were given on the main theme of "Technical innovation for typhoon related forecasting ad disaster risk reduction" . One is "Advanced risk-based information leading to enhanced local disaster risk reduction through cross-cutting cooperation between Working Groups" by Mr.Eito, Head of RSMC Tokyo and Ms. Igarashi, JMA . On day 2and 3, three parallel sessions took place and participants attended individual working groups: JMA for working group for meteorology, MLIT for working group for hydrology and ADRC for working group for DRR. The WGDRR Parallel Meeting started with attended by 20 participants from nine members including China, Hong Kong, DPR of Korea, Lao PDR, Macao, Philippines, Republic of Korea, Vietnam, USA, Thailand, Malaysia and Japan. Participants presented their report on the activities on DRR in 2018 and typhoons. On day 4, In the plenary session, chairs of each working groups was reported and discussion on Cross-cutting Projects between working groups was done.